In a flurry of buzzwords, YouTube star PewDiePie and Disney’s Maker Studios announced a partnership that brings us Revelmode. What is Revelmode? Well, that’s a little less clear. Revelmode is being called a “network.” Which is technically true in that the end result is a bunch of content creators working under a single brand name, “networked” like a bunch of computers. Multi-channel networks are basically the YouTube equivalent of going from indie filmmaker to movie studio contract. 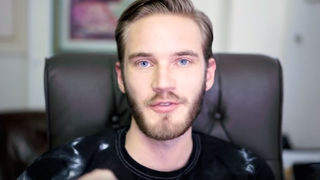 PewDiePie (whose IRL name is Felix Kjellberg) even says in the announcement video that joining one loses “hipster cred.” Not that anyone can be blamed for throwing their lot in with Disney money. And Disney security. Revelmode isn’t just PewDiePie giving money and other resources to a bunch of other YouTubers, of course. Revelmode is going to be a network under the larger umbrella organization of Maker Studios. Maker, of course, is now owned by Disney. It’s a Russian nesting doll of interests, with the hope being that Disney can squeeze some money out of YouTubers. Of course, we’re assuming from context that this is going to be a digital network of some kind. Everyone’s talking like we know exactly what this all means, when the actual words are super vague. “Revelmode is me and a bunch of really awesome YouTubers coming together as a group to do awesome things,” was PewDiePie’s opening description in his announcement video. Including PewDiePie, Revelmode’s roster is nine-deep: CinnamonToastKen, CutiePieMarzia, Dodger, EmmaBlackery, JackSepticEye, Jelly, Kwebbelkop, and Markiplier. And you’ll get to see them all as cartoons in the very first Revelmode show. It’s going to be fascinating to see if Disney’s investment actually pays off for them. Everyone’s trying desperately to figure out how to monetize internet videos on a more massive scale. And rolling up to established internet figures with bags of cash and offering to give them some of that money is a perfectly valid attempt. But that also brings us one step closer to Disney owning every bit of media we consume.